I was at Sephora and came across the most beautiful array of eye shadow colors in a Bare Minerals Eye shadow palate and just had to have it! 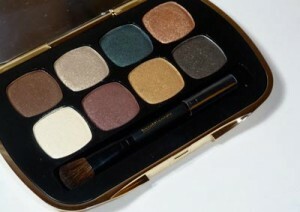 This gorgeous palate contained many highly pigmented golds, greens, browns and a gorgeous red/brown that I have never seen before. All of the shadows had very glittery undertone to them and when tested had very strong coloring. I was really excited to get home and create a sultry smoky eye with these colors ( I always do my smoky eyes in brown tones because I do not think gray looks very good on my skin tone). This review has a good and a bad side so let me explain. After applying my eye shadow primer I started applying the shadows and was very pleased to see that they pigment was so intense, it was gorgeous! The shadows blended well and were easy to apply. The negative side of this review comes from the fact that my cheeks and bottom of my face were also covered in the shadow. I use brushes not foam eye shadow applicators and lightly tap the excess shadow off my brush before applying to my lids and still the shadow was everywhere. I had to use eye make remover on the bottom of my face which wouldn’t be a big deal except that it then wiped off my lotion and face primer. Even though the shadows are packed the way they fall everywhere is similar to a loose powder. Additionally, I wear contacts and had to take them out to clean them off as eye shadow had fallen in and stuck to my contacts. This especially happened when I used some powder underneath my lower lash line to create a dramatic effect. I will say though that once the shadow is on it is really not going anywhere. Mine lasts all through the day and night and still has a lot of color at the end. Bottom Line: Beautiful, highly pigmented colors but they tend to get everywhere during application.